I love teaching piano. I’ve been teaching piano since 1989—primarily to children and teens. I live in Scottsdale, Arizona near Frank Lloyd Wright Blvd and the 101. My husband and I moved here from Nashville, Tennessee in 2005. From 2005 until 2009, I taught at a music/arts studio called Voices here in Scottsdale. Currently, piano lessons are offered out of my home studio. Mostly, however, I drive to the homes of my students; many parents find this much more convenient. When I lived in Nashville many of my students participated successfully in National Piano Guild auditions. I taught in my home studio and was a member of the Piano Teachers Guild. The monthly Guild meetings were helpful in developing my philosophy and skills for piano teaching. 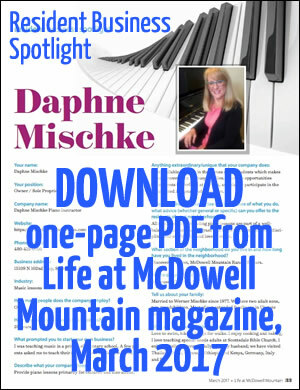 Daphne Mischke is an active member in the MTNA. Here in Arizona, I’m a member of the Music Teachers National Association (MTNA) and participate in local chapter meetings in the Valley, namely, the East Valley Music Teachers Association. Some of my students participate in the Arizona Study Program, which is linked with MTNA. This involves adjudication of four memorized pieces and a music theory exam, for which they prepare all year long. I teach from method books such as Faber & Faber’s Piano Adventure series. Music theory is an important part of weekly lessons. Various styles of music—including classical, pop and contemporary—are part of the repertoire. I have experience teaching special needs students. Educational research into the learning process shows that learning is enhanced by joy. That’s why we use creative methods to make piano lessons joyful and interesting, as shown by the photos below. I use a variety of piano pedagogy resources including Wendy Stevens’s outstanding materials at ComposeCreate.com. Plus, we use various music learning apps in my iPad Pro, including Rhythm Swing, Note Rush, and Piano Maestro. Katie learns note reading with these candy corn flash cards. Markus matches notes to keys on the piano with Wendy Stevens “Football Fever Note Cards”. If you are interested in piano lessons for your son or daughter, please contact me. Many references are available from happy, satisfied parents.